Kenai Wild Salmon Co. is a fishermen's direct market for wild Alaska salmon. We deliver fresh and ship frozen salmon! Would you like to fill your freezer with premium sockeye or silver salmon? Interested in purchasing affordable, fresh, wild-caught salmon? Too busy to go dipnetting this summer? Get your salmon from us and support local fishermen and sustainable wild fisheries! We catch and deliver fresh, whole salmon and we ship frozen fillets or portions. Kenai Wild Salmon Co. delivers fresh salmon during June, July and August and ships frozen salmon while supplies last. 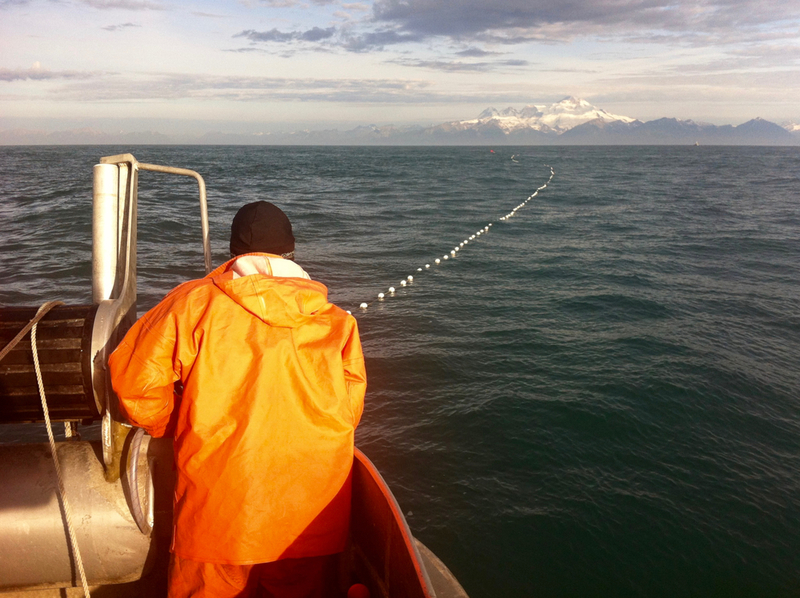 We're commercial fishermen who fish the ocean waters of Cook Inlet in south-central Alaska. This fishery is located close to the road system, which allows us to quickly offload our boat and deliver premium salmon to you at a convenient location within hours of catching them. We are completely sold out of our catch from 2018. We will start fishing for salmon again in late June, 2019. Please contact us to get on our advance order list. 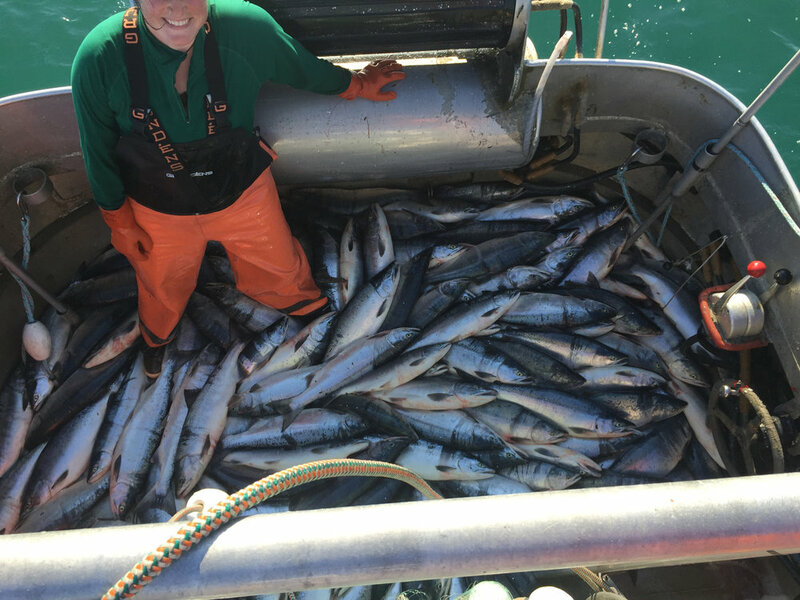 We love connecting Alaskans with fresh, wild salmon! We directly market sockeye (red), coho (silver), and chum salmon. After you place your order, we will catch your fish and arrange for delivery at a convenient time and location. Our salmon are immediately bled and iced. We sell whole fish, not by the pound. The cost of delivery, ice and local sales tax are included in our prices. We deliver on the southern Kenai Peninsula between Homer and Sterling. Payment is accepted upon delivery. We also ship to our Alaskan neighbors in Anchorage and Fairbanks on RAVN Air Cargo with customer pick-up at the airport. Pay using secure online invoicing by Square™. We are completely sold out of the salmon we caught in 2018. Please contact us if you are interested in getting on our pre-order list. We will start fishing for salmon again in late June, 2019. Our fresh salmon are picked from the net and immediately dressed (gilled & gutted) and then packed with flake ice. We sell our fresh salmon by quantity (per fish) and not by weight. To see how much our fish cost per pound, click here. Our fresh salmon are only available from late June to mid-August. Please contact us if you are interested in getting on our advance order list for 2019. Please let us know: 1) Where you'd like your salmon delivered, 2) How many and what kind of salmon you'd like, and 3) When you'd like your fish. We will get back to you with more information. We have a custom processor fillet, vacuum package and freeze sockeye salmon that we catch. We ship overnight to most locations in the "lower 48" using FedEx. We also ship to our Alaskan neighbors in Anchorage and Fairbanks on RAVN Air Cargo with customer pick-up at the airport. We offer two size shipments: 14 or 40 pounds. You get to choose whether you want individual packages to consist of half-fish fillets or a mixed box of 1/2 to 1-pound portions (our favorite and a perfect meal for two). Shipping cost is included in our prices. Pay using secure online invoicing by Square™. Prices include overnight shipping to your door. To see how much our frozen salmon costs per pound, click here. We are completely sold out of the frozen salmon that we caught in 2018. Please contact us if you are interested in getting on our pre-order order list for 2019. We will start fishing for salmon again in June. Please let us know: 1) Where you'd like your fish shipped, 2) What size box shipment (14 or 40 pound) and 3) What size portions (fillets or portions) you are interested in. We will get back to you with more information. Chuck and Stephanie moved to Homer, Alaska 14 years ago. Traveling and working throughout southwest Alaska inspired them with a love of salmon and a passion for commercial fishing. They live year-round in Alaska and own a commercial fishing boat, the F/V Ounce. This is their 6th season operating the Ounce in Cook Inlet. Off the water, they are backcountry adventurers, Chuck is a carpenter and Stephanie is a soil-scientist. As Alaskans, Chuck and Stephanie think that "fishing and salmon are a way of life and part of who we are". Jillian is a born and raised Canuck who moved to Alaska nearly 15 years ago to pursue her dream of dog mushing. She ran dogs until last year, and has had adventures with her canine companions across the state, throughout Canada, and in Northern Finland. Now, she’s looking for her next great Alaska adventure! She’s a greenhorn if ever there was one but she sure learned a lot during her first, albeit too short season on the F/V Ounce. Our fishing vessel, the Ounce, was built in 1961 by Sam Matsumoto in Vancouver, British Columbia. She is a 32-foot aluminum sternpicker. 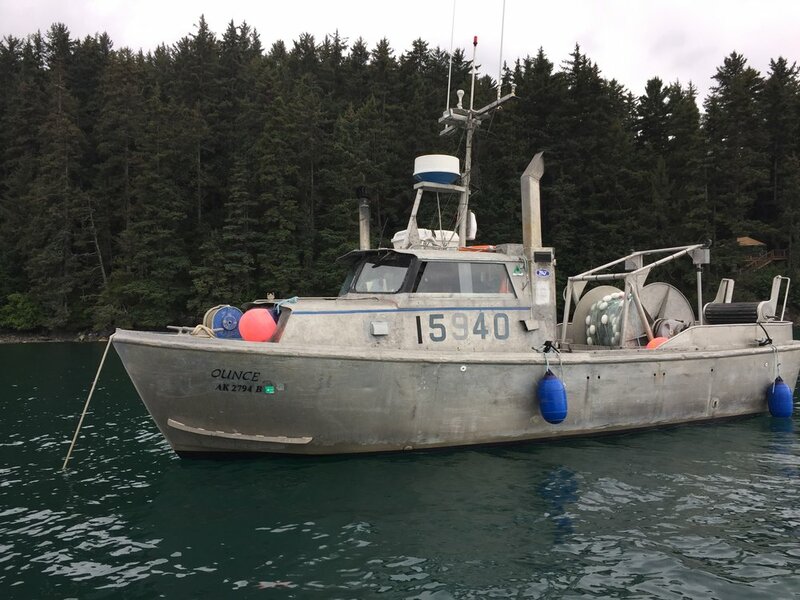 She was built for the Cook Inlet gillnet fishery and originally owned by Kenai Packers, Inc. - a cannery established in 1949, which has since closed. Harold Daubenspeck, the owner of Kenai Packers, was an innovator of what is now the ubiquitous aluminum drift boat on Cook Inlet and Bristol Bay. He leased many boats to fisherman for a share of their catch. Daubenspeck named his fleet of fishing boats after animals, birds, and even large cats. 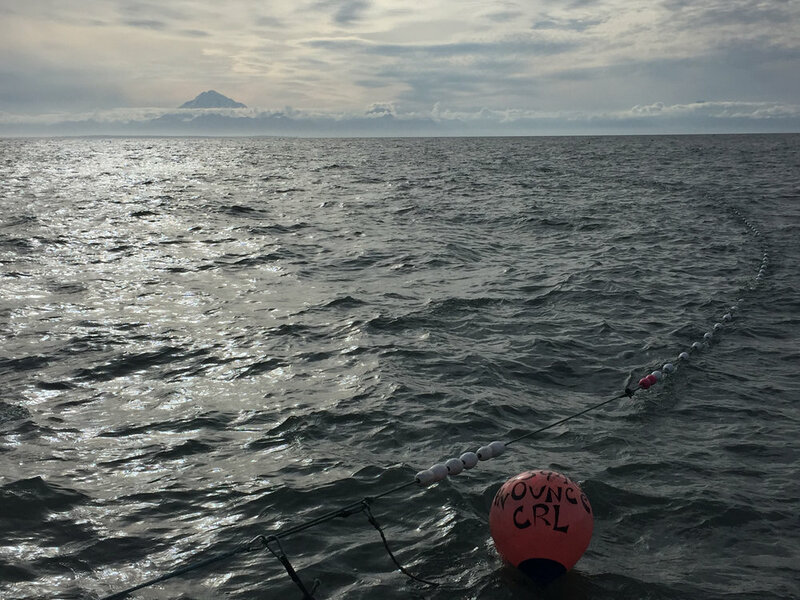 Our vessel, the Ounce, is known around Cook Inlet as a "cat-boat". It is named after the Snow Leopard, whose scientific name is Panthera uncia. The occasionally used English name Ounce is derived from the old French "once", originally used for the European Lynx. Contact us by phone, email or fill out one of the web forms above. Let's say you order 20 fresh sockeye salmon and we tentatively agree on a delivery date and location. We'll keep in touch with you when we are fishing. When we know that we will be able to deliver your salmon, we'll contact you and arrange for delivery that night or the next morning. If that time doesn't work for you, we'll contact you again at a later date. You will be part of the process. We meet, you get your premium, fresh salmon and we get paid. DO you deliver fish every day? No. Our main job is catching salmon, our second job is catching up on sleep, but our favorite job is getting you fresh, wild-caught salmon. That said, we can't exactly plan on catching your salmon or delivering them on a specific day. At the peak of the run in late July, we hardly leave the boat and there is simply no time for personally delivering salmon. Some days we only catch 20 salmon, some days we catch a thousand. Our season of operation is mid-June through mid-August. We have a mobile retail seafood vendor permit and deliver to Homer, Soldotna and places in between. We deliver to the anchorage Anchorage area 1 or 2 times a season. Can you fillet my fish? No. We are not permitted by the Food Safety and Sanitation Program to "process" your salmon. We will bleed and gut your fish (unless you prefer otherwise) right after we pick them from the net. We can arrange to have your fish filleted by a custom processor for an additional charge. We accept cash or credit card. Payment is accepted for fresh salmon upon delivery. Advance payment is required for shipment of frozen salmon, Pay using secure online invoicing by Square™. One or more coolers and payment. We provide ice, bags, and a hand-washing station. For reference, a large cooler is big enough for about six of our large salmon. CAN I MEET YOU AT YOUR BOAT? Yes and no. You are welcome to meet us at our boat when we dock in the Homer Harbor during June and early July. Unfortunately, the commercial fish docks on the Kasilof and Kenai Rivers are industrial work sites and are not appropriate for retail sales. Why Don't you sell by the pound? We pick the nicest, largest fish from the net and set them aside for direct marketing. These sockeye salmon each weigh about 6 pounds, whole and will provide about 3-1/2 pounds of skin-on fillets. Because most of our customers are buying five or more fish, and because we deliver to you directly from our truck or off the boat, we've found it more practical to sell by quantity. You know in advance exactly how much your fish will cost. How Much does your fish cost per pound? We don't sell fresh salmon by the pound. If you do the math (and we've already done it for you), you will find that at $22 per fish our fresh sockeye salmon costs approximately $3.30/pound (whole) or $6.30/pound (skin-on fillets). That's a great price for premium, fresh, wild-caught sockeye salmon and includes delivery, ice and local sales tax (when applicable). At $15 per fish, our fresh silver salmon (coho) cost approximately $2.15/pound (whole) or $4.00/pound (skin-on fillets). At $12 per fish, our chum salmon cost approximately $1.85/pound (whole) or $3.50/pound (skin-on fillets). WHY DOES YOUR FROZEN SALMON COST MORE? Shipping costs alone account for about 1/3 of the price of our frozen salmon. We also have a custom processor fillet, package and freeze your fish. Our prices are competitive and you will be getting premium, wild-caught Alaska salmon delivered to your doorstep. How much does your frozen salmon cost per pound? We will have your frozen salmon fillets or portions weighed on a certified scale. Our frozen sockeye (red) salmon costs $11/pound and our frozen coho (silver) salmon costs $9.25/pound plus the cost of shipping and boxing. If you want your frozen salmon shipped to the continental US, you will find that our frozen sockeye (red) salmon fillets and portions cost approximately $15 to $18/pound. Our frozen coho (silver) salmon fillets and portions cost approximately $13 to $16/pound. This price includes overnight FedEx shipping to your door. Due to shipping costs, it's a better deal to buy in a larger quantity. I can't say enough about the quality of fish I received from them. They delivered the fish to my front door, which was very convenient. The fish arrived fresh, on-ice, and in great condition! I work a lot during the summer and I can't always get out to catch my own fish. They made it really easy for us to have fresh, high quality fish to smoke and fill our freezer. I truly have never been SO impressed by the "Tender Loving Care" given to The Catch of Any Commercial Fisherman, EVER! The Sockeye were Bled, Iced and "Ocean Bright!" Super Quality! Kudos to You!!! The fish we purchased from you was ridiculously fresh, exceptionally packaged, and amazing in quality. My kids usually won't eat any kind of fish (except fish-sticks) except for the amazing salmon we got from you. My two oldest fight over any extra pieces and even eat the skin! We are spoiled now and will never eat grocery store salmon again. We will hopefully be buying a shipment from you every year. Thank you for the awesome fish, we can't wait for another big white box straight from Alaska!! !